Peak Design has introduced the carry-on Travel Backpack 45L, the first in its new Travel Line designed "to satisfy a simple design directive: no two trips are the same, so the best luggage should adapt to them all." "From day one, travel has been a primary inspiration to us as photographers, designers and adventurers," Peak Design Founder and CEO Peter Dering said. "Living on the road is part of our DNA as a brand and we couldn't be more excited to have built a set of travel gear that truly adapts to the endless variety of trips we take." In addition to full rear access for easy packing, the Travel Backpack features dual side access, top access to laptop/tablet and a dedicated front-access organization panel for smaller items. Shoulder and waist straps stowe instantly beneath a magnetically sealed back pad. Expansion zips allow the bag to grow to 45L check-in size, while a compression snap system shrinks the bag down to a 35L daypack. Details include 360-degree grab handles, a duffle/luggage carry handle, theft-deterrent zips, hidden passport pockets, a soft-lined sunglasses pocket and tuck-away external carry compression straps. The Travel Backpack comes with a weatherproof 400D nylon canvas shell made from 100 percent recycled plastics and available in black or sage colorways. The $299.95 Travel Backpack and Packing Cubes are available now on Kickstarter for a pre-sale discount. The system will then be available for purchase online at peakdesign.com and through major retailers in time for the holiday season. 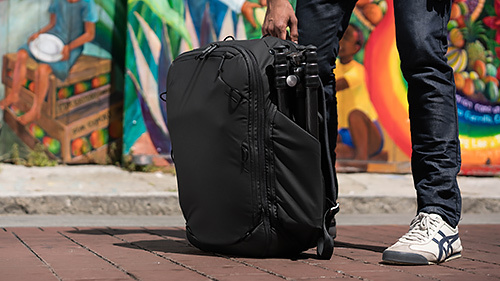 SAN FRANCISCO -- Peak Design, the leader in crowdfunding and best-in-class carry solutions, is proud to unveil the first products in their Travel Line: the Travel Backpack 45L and complete system of Packing Tools. With a focus on versatility organization and access, the Travel Line aims to satisfy a simple design directive: no two trips are the same, so the best luggage should adapt to them all. Peak Design was founded during a trip and has grown into a team of prolific travelers who understand life on the road. The Travel Line combines Peak Design's travel experience with their expertise, innovation and design philosophies honed through their massively successful photography and everyday bag lines. 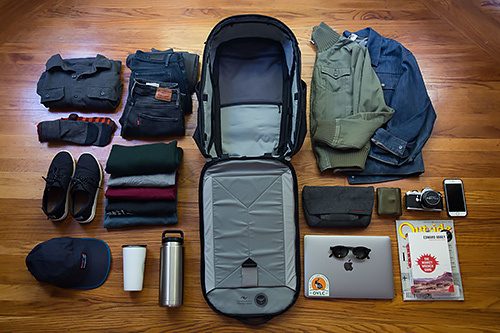 The hero of the Travel Line is the Travel Backpack 45L, a carry-on-sized backpack that boasts a collection of best-in-class travel functionality. In addition to full rear access for easy packing, the bag features dual side access, top access to laptop/tablet and a dedicated front-access organization panel for smaller items. Beefy shoulder and waist straps stowe instantly beneath a magnetically sealed back pad. Expansion zips allow the bag to grow to 45L check-in size, while an innovative compression snap system shrinks the bag down to a 35L daypack. Thoughtful details include 360-degree grab handles, a duffle/luggage carry handle, theft-deterrent zips, hidden passport pockets, a soft-lined sunglasses pocket and tuck-away external carry compression straps. The Travel Backpack comes with a weatherproof 400D nylon canvas shell made from 100 percent recycled plastics and available in black or sage colorways. Peak Design Founder and CEO, Peter Dering, rarely stays in any one place longer than two weeks: "From day one, travel has been a primary inspiration to us as photographers, designers and adventurers. Living on the road is part of our DNA as a brand and we couldn't be more excited to have built a set of travel gear that truly adapts to the endless variety of trips we take." Each Packing Tool was designed from the onset as a standalone product, intended to push their respective category forward with unique patterns, features and innovation. Art Viger, Lead Designer at Peak Design, commented on the system: "When you travel, the things you carry become your home on the road. Each and every one of the pouches and cubes are designed to work as a fluid ecosystem that can be easily re-configured for any type of trip." The new Travel Backpack (MSRP: $299.95) and Packing Cubes, will be available on Kickstarter for a pre-sale discount beginning July 23. The system will then be available for purchase online at peakdesign.com and through major retailers in time for the holiday season.